That time of year again, and oh what a grand time of year it is. Tomato season! I can eat them daily and many times we do in so many ways. But the simplest is a tomato sandwich, on toasted bread, slathered in mayo with a heavy hand when salting the tomato. Heaven. 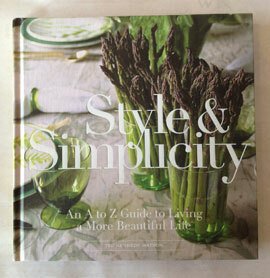 Add a glass of rosé and a good book, and it might be one of my favorite August activities without breaking a sweat. As mentioned a few weeks ago, I am a purist, and Summer is not officially over for a few more weeks and I am going to savor every last drop of the season. While many think of rosé as the drink of the sunny months, we, along with many others enjoy it year round. Enjoying a roast chicken while it snows outside having a glass of rosé is pretty poetic. I digress, as the pink wine has a very special place in my heart. 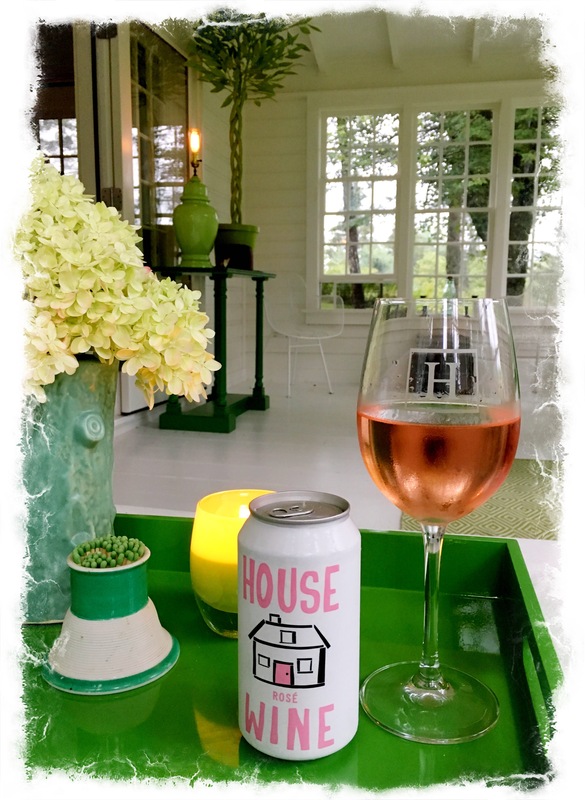 Now onto Wine Wednesday and this very clever can of rosé from House Wine. I mean seriously, how fabulous is that? My love of high/low is showing, as this quite yummy wine is housed in a can, making it easy to pack up on ice for a picnic or swell to serve for a beach gathering where you might not want to have glassware. Or fab when you are only wanting a glass and don’t want to open a bottle. To say I am tickled pink is a slight understatement. From the maker: Created in 2004 by acclaimed winemaker Charles Smith, House Wine was designed with the goal of providing maximum value and quality in an iconic minimalist package. House Wine brings great wine, at a great price, to any great occasion. Tasting Notes: Fresh and fragrant aromas lead to a wonderfully bright palate. Flavors of juicy citrus and ripe strawberry are rounded out by a refreshingly crisp finish. I am a bit of a season purist, preferring to enjoy each right up until the day of the change as the calendar represents it. But I also know many folks head right into Autumn mode the day after Labor Day and say ‘so long’ to Summmaaa, and I get that too. 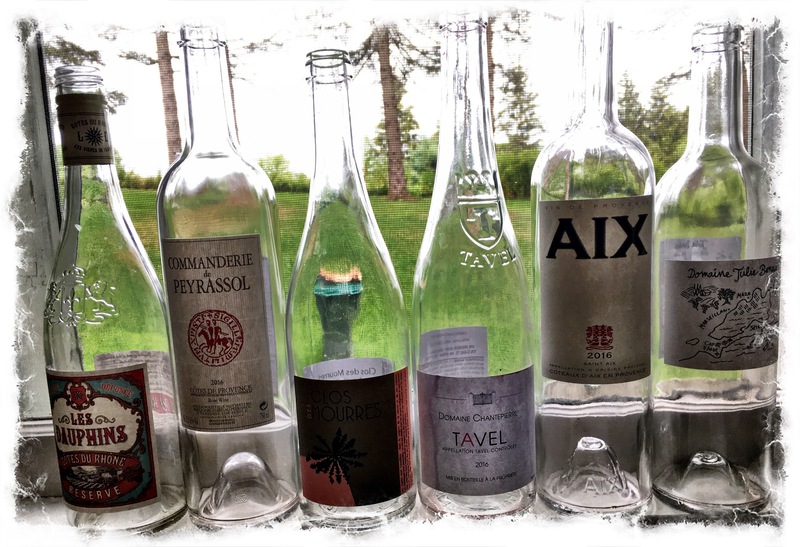 This Wine Wednesday post is for both mindsets, one just gets a few more options to offer this rosé tasting. The rosé sections at most wine shops & grocery sections is looking pretty depleted at this point in the season. Now is the time to pick up those singular bottles that have been catching your eye, but you pass on it as you had been seeing your favorite, up until now. We did this on Sunday with a bunch of our nieces at Hawthorne, where we were hosting a slumber party. Starting at lunch, working through supper on into the eve and board games. We all tried a bit from each and our niece Haley took notes along the way on each bottle, so when next year rolls around, we might have a new favorite. It was fun to chat about likes/dislikes and hear how each person described the wine. Our oldest Sive niece Caitlin is an accomplished chef, having prepared a dinner at The James Beard House (sort of a big deal in the foodie world, and I am a super proud Uncle, so thought worth the mention…), so it was a huge learning lesson for us all hearing her describe each wine. Big gathering or small, this is a fun time of year to give this a go. Cheers to Summer, whenever it ends! It is fun to look back at past posts and see what was rolling through my mind at the time. I wrote about this extraordinary rosé a few years ago, and I would not change a word. See next paragraph below. We shared a bottle the other evening–a relaxing meal up in the studio treehouse, just us two, watching the boats sail on by. We have been having a long streak of crazy good Summer weather so we have been grabbing every chance possible to revel in it. 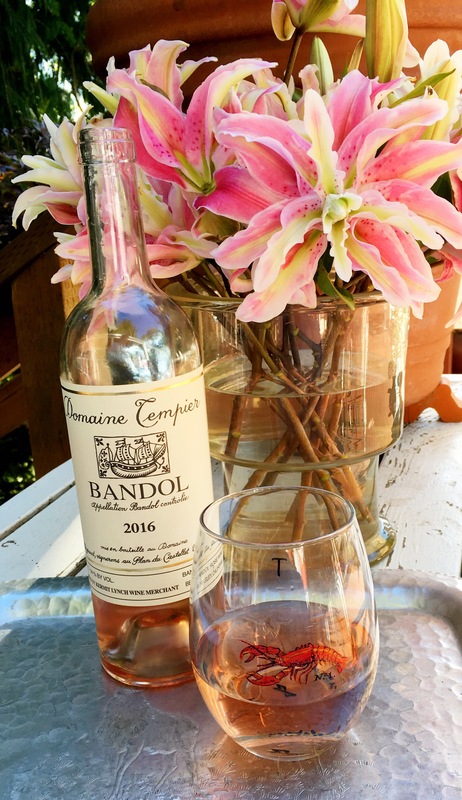 There are tons of lovely bottles of rosé out there, but if pushed to say what my absolute favorite is for my “Wine Wednesday” pick, I would have to say Domaine Tempier Bandol rosé. I get that same elated feeling when opening a bottle of Veuve. It has a specialness to it. It would not be something consumed often, so there is just a festive feel when you get to enjoy a bottle. Brought to the States by the esteemed Kermit Lynch out of Berkeley. Produced in the Bandol region by the now world famous Peyraud family. Opening a bottle of this is pure sunshine. Their rosé is 55% Mourvèdre, 25% Grenache, 20% Cinsault. It has that lighter pink color that I always strive to match when choosing a rosé by other makers, as Domaine Tempier is the benchmark I hold for all others. I don’t really believe in saving things for ‘special’ occasions, as I think that diminishes the specialness of every day. So the next time you want a serious treat (sitting with a friend catching up, seeing a loved one you have missed, or you just want to celebrate the day) and you are looking for a rosé, hands down this is what I would grab. Wine Wednesday brings a new rosé to my ever-expanding roster of French varieties. My eye went right to that label, being a lover of all things crown related, which was the first thing that grabbed me. 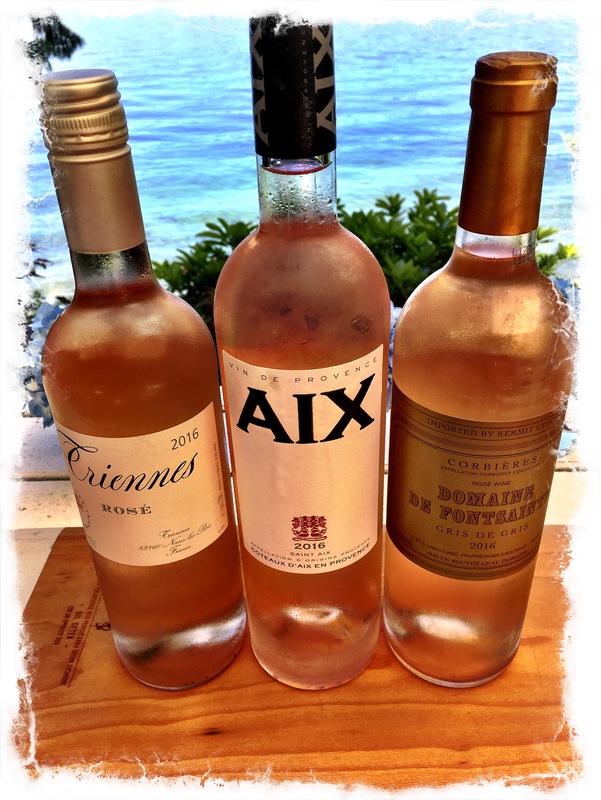 Our island grocer stocks wines both high & low, but there is always a heavy concentration of rosé this time of year under $20, which is hits the sweet spot for me for the beloved pink. So in the basket it went to be enjoyed for a dinner for two under the umbrellas on what has turned out to be a stupendous city and island July. From the maker: Named after the two guardian towers of the castle, Les Gardettes is the entrance to the castle and to the Montfaucon range of wines. 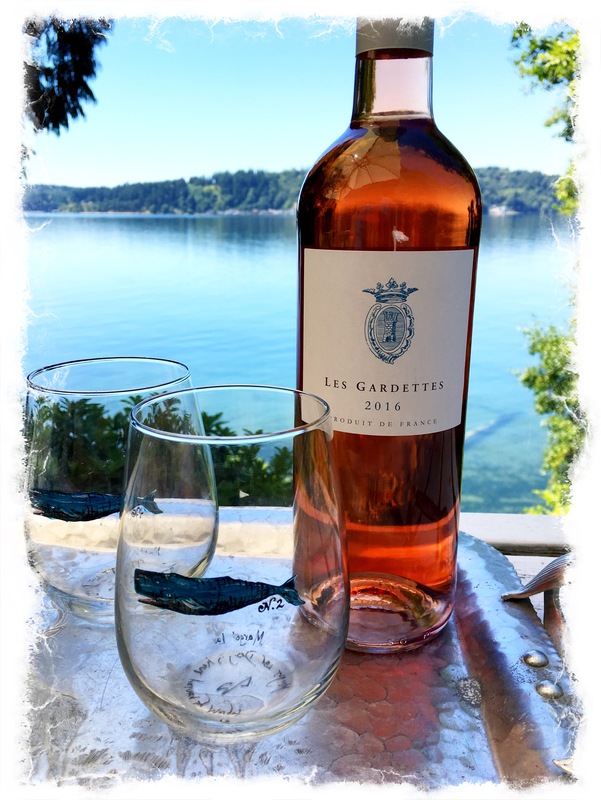 Concentrated in both color and flavor, the Les Gardettes rosé delivers a healthy dose of French relaxation just like good rosé should. This blend of Cinsault, Counoise and Grenache is a true rosé de saignée (French for “bleed”) where some of the wine is removed from the vat leaving a smaller amount of wine left to bleed with the skins which intensifies color, tannins and concentration. Les Gardettes is full of strawberry, peach and other stone fruit flavors supported by good acidity and freshness. Wine Wednesday is a trio of rosé that are the top of my list when I am looking for bottles under 20 bucks. So often we are serving rosé for a crowd, so it is nice to able to get a nice assortment without breaking the bank. The above three never disappoint. French rosé has a special place in my heart, especially when it is pale, pale pink. I have written about each of these three singly but wanted to give them a shout-out again, this time as a grouping. They make for a festive little wine tasting at your next gathering. Nothing overly serious, just a fun way for folks to mingle, pour themselves a glass, and mingle some more. It is also a great way to keep guests quite happy if you need to step away to tend to further meal prep. Triennes, Domaine de Fontsainte (brought into the States by Kermit Lynch of Berkeley, of which I am a huge fan), and AIX. When in doubt if you are standing in the wine aisle, grab one or all three of these bottles for an exceptionally good pink option/options.